I don’t think I buy too many books, but I do feel that I have too many books in my apartment. When I began blogging a few years ago, I rarely bought books. I preferred borrowing from public and research libraries. Unsurprisingly, book blogs and booktube inspired me to buy more books. To limit my buying habits, I purchased a Kindle. Since I prefer reading Classics, I thought buying a Kindle would save me a lot of money. It did. However, I soon discovered Half Price Books (the second-hand bookstore in my region where all books are half off the original price), and my purchasing increased exponentially. I realized that I prefer to own physical books. I really don’t care what condition they are in, but I want to have my own personal library of books that I have read and enjoyed. My TBR is larger than I would like. Although I want to keep a personal library, I don’t want to have too many unread books. I worry that owning too many unread books means that I am just a pretentious reader, keeping books that I have never read to feign my erudition. However, I do read a lot. I prefer to read works that are rich in philosophy and intertextuality. I actually enjoy reading the kinds of books that make one sound like a snob. I blame this on Academia. It’s really hard to avoid reading obscure, difficult books while in a humanities graduate program. Academia teaches us to have very niche interests and to set ourselves apart from the general reading public. I am currently writing a term paper on the influence of materialistic determinism on Diderot’s Le Fils Naturel. All of our paper topics are as complicated and niche as this one. So inevitably (pun intended), the books I read are not the kinds of books the general public reads. This only heightens the anxiety I have over my TBR. I feel a greater pressure to read the books that I’ve purchased because if I don’t, I come across as pretentious. I have a lot of difficulty determining which books I should review on this blog and which books I should read without reviewing. Will anyone care that I read this study on Diderot? Maybe I should review Seneca’s Letters from a Stoic, but how many viewers care enough about Biblical scholarship to read the Art of Biblical Narrative (a fantastic book by the way)? I have not found a perfect solution to my dilemma, but I have decided to do something to minimize my discomfort. I have decided to limit my book buying and read more of the books on my TBR even if they are inappropriate for this blog. Today, I am giving away a stack of “read” books to the local public library. I don’t want to keep books I know I won’t revisit even if I enjoyed reading them the first time. Finally, I have decided to review less and make more frequent “reading update” posts. What have you done to address your TBR problems (if you have any)? The Diary of a Country Priest by Georges Bernanos was my favorite book of 2016. Unfortunately, it seems like the English translation is not very good. I have noticed that, in general, French does not translate well into English. If you can read French, I highly recommend you read this novel. There is, however, a 1951 film adaptation of the novel. The director is Robert Bresson. Although it is a French film, you can watch it with English subtitles. 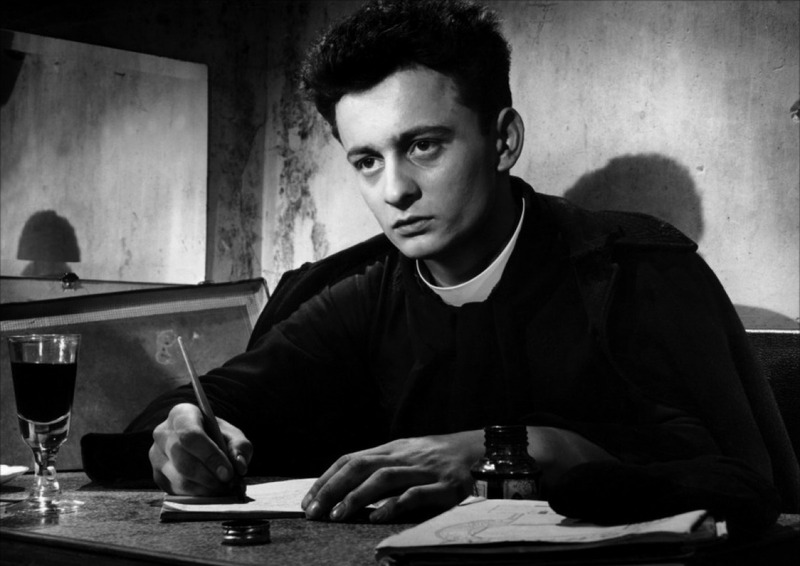 Journal d’un curé de campagne (film) is a black-and-white, slow-moving drama about an unnamed country priest who tries to minister to a wealthy family in the village. He is pious and somewhat of an idealist. The people he tries to help are not interested in religion. The curé’s spiritual director and the other parishioners are convinced that our country priest is a womanizer and a drunk. Because the roman is a series of diary entries, there are numerous voice-over segments in the film. I didn’t mind the voice-overs. So much of what the priest experiences cannot be shown on screen. There were scenes in the book I wish were more emphasized in the film. For example, the curé’s spiritual crisis is pretty underwhelming. Perhaps, the most irritating aspect of the film is the presentation of the country priest. He doesn’t have a personality. His facial expression remains the same throughout the film. Even a suffering man experiences different emotions from time-to-time. The country priest is pitiable but not very memorable. I prefer the priest in the book. The cinematography is exquisite. A black-and-white film is perfect for the story because Journal d’un curé de campagne is a character-study. I prefer character-centered and philosophical films in black-and-white. Overall, Journal d’un curé de campagne (film) is a beautiful production in its own right, even though I personally prefer the book. Last week I did a Literary Miscellanea post on a book-to-movie adaptation of Frances Hodgson Burnett’s The Secret Garden. The adaptation I am focusing on today is actually a mini-series (1996) and is deliberately unfaithful to the book in some important ways. Yet, I really liked the adaptation. Spoilers are included. As you may know if you have been following my blog for some time, Gulliver’s Travels is one of my favorite books of all time. I wrote a spoiler-free review and a spoiler-y reflection post for it. Swift was a master satirist. The 1996 mini-series is directed by Rob Letterman, and Lemuel Gulliver is played by Ted Danson. Unlike the book, the story of Gulliver’s travels are told by the protagonist not in a written memoir but in a psychiatric ward. He is considered unfit for society by Dr. Bates who tries to destroy the relationship between Lemuel and his wife Mary. Dr. Bates wants Mary for himself. As expected, Gulliver’s travels are told in the mini-series through a series of flashbacks. What I enjoy about the mini-series is the focus on perspective. Gulliver believes that all of his trips were real, but he is having a hard time convincing others of his sanity. Even his wife and child think he’s delusional. A lot is at stake. If Gulliver does not convince the people around him that his adventures were real he loses forever the people he loves. Like the mini-series, Swift’s work is all about perspective. Gulliver’s identity is defined and redefined by the creatures he meets in his travels. He needs their affirmation. But whereas Swift focuses on the evolution of Gulliver’s character, the mini-series focuses on the unchanging society to which Gulliver has returned. In the book, Gulliver doesn’t realize that he has changed. In the mini-series his oddity is lost on no one. Gulliver was rejected by the Houyhnhnms, but he cannot afford to be rejected by his family. The mini-series is not very long (a little over 3 hours), so it can be viewed in one sitting. Even if you do not like Swift’s Gulliver’s Travels, you might still enjoy the adaptation. But if you did like the book, I think you will find this new perspective delightful. Note: Literary Flashback has been renamed to Literary Miscellanea because the older name no longer makes sense. Literary Miscellanea is the section of my blog dedicated to “non-book-review stuff” (reflection posts, essays by famous authors, passages from favorite works, etc.). For the next few weeks I will briefly discuss some book-to-movie adaptations that I enjoy. Spoilers will be included. You have been warned. Today I will focus on The Secret Garden by Frances Hodgson Burnett and the 1993 film adaptation directed by Agnieszka Holland (Maggie Smith plays Mrs. Medlock). You can read my review of Burnett’s The Secret Garden here. As I wrote in my review, I mostly enjoyed the book, but I found the philosophy a bit off-putting. I am quite open-minded when it comes to other peoples’ religious or philosophical views, but Christian Science’s belief in praying away sickness just doesn’t sit well with me. Colin is a hypochondriac, so his sickness was imaginary anyway, but Burnett implies in a few places in the book that good thoughts can help legitimately sick people be cured. Still, the book is a celebration of childhood. Friendship helps overcome personal and family challenges. The 1993 film adaptation is the first Maggie Smith movie I ever saw. The film itself is (in my opinion) far superior to the book. The philosophy that I found so problematic in the book is mostly absent from the movie. Magical realism replaces positive thinking. The focus is entirely on the power of friendship. The garden is stunning. I think we can all agree that English moors and gardens look better on the screen than on paper. Roses and Empress of India lilies grow everywhere, and Dickens’ robin is a charming character. We never meet Martha’s family, but Martha’s character makes up for the lack. But the most compelling character in the movie is Lord Archibald Craven. When his wife dies he locks up the garden and runs from the world. Mrs. Medlock never questions Lord Craven’s belief that Colin is dying. He has cast a spell on the whole manor, and only Mary knows the truth. She has to convince Colin and his father that their fears are imaginary, but this is a tall order. As expected, innocence is restored when Lord Craven returns to his garden. The 1993 Secret Garden film may not be a masterpiece of cinematography, but it is still very good. Some critics fault it for not being optimistic enough, but the darkness underscores Lord Craven’s neurosis. His fears and sorrows have crippled (in more than one way) not only himself but his 10 year old son who has never even experienced sunlight. If you have read and enjoyed Burnett’s book, I highly recommend the 1993 film adaptation. This week’s Literary Miscellanea is the continuation of a discussion started last week about the role of the novel on literary criticism. Willa Cather in her 1933 speech said that “The novel is the child of democracy and of the coming years”, thus framing discussions about the rise and popularity of the novel in the context of increased democratization. Today, I will be using an example from French literary history (the debate surrounding La Princesse de Clève) to illustrate her point. My information comes from chapter two of Joan deJean’s How Paris Became Paris: The Invention of the Modern City. The debate surrounding Marie de La Fayette’s romance novel La Princesse de Clèves must be viewed against the backdrop of the Culture Wars and the Battle of the Books (between the Ancients and the Moderns) at the end of the 17th century. Boileau, who represented the side of the Ancients, decried the replacement of the play (the dominant literary form of much of the 17th century) with the novel. 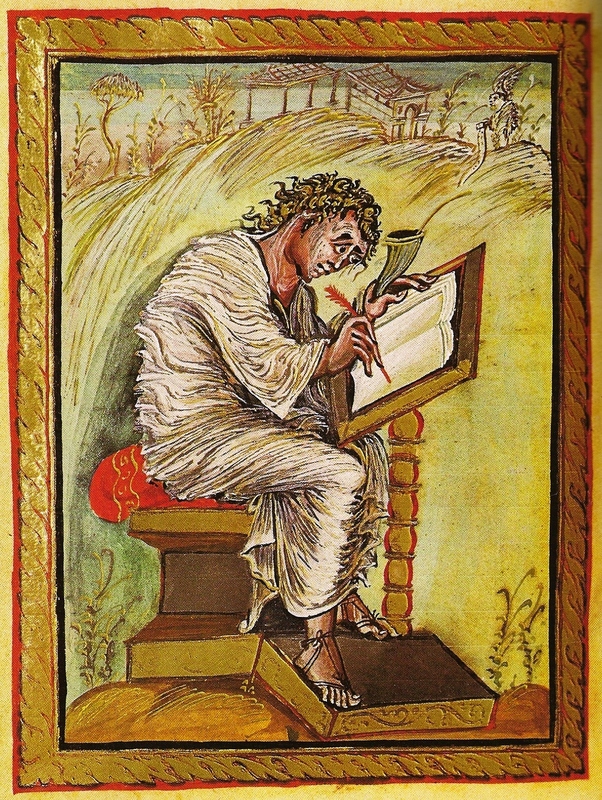 The Ancients praised the classical authors for having mastered all the genres of literature. Why stray from the well-worn path? The Moderns, such as Charles Perrault in his poem Le Siècle de Louis le Grand, put individual taste and judgement over tradition. The “I” replaced the “we”. Boileau’s criticism of La Princesse de Clèves centered on his fear that the public was replacing the “experts” in literary criticism. Often, when we think of literary history we consider how the politics of a time period influenced a particular work. We do not, however, consider the effect of the book industry on intellectual movements. The novel (as Cather indicated in the speech I discussed last week) democratized literary criticism. In the case of La Princesse de Clèves, the newspaper Le Mercure galant had a column dedicated to readers’ reactions to the novel. Jean Donneau de Visé, the editor of the newspaper, came up with discussion questions for La Princesse de Clèves and encouraged readers of the novel to meet in groups and send him answers to his reflection questions. The reactions of the readers were then published in Le Mercure galant. Donneau de Visé, thus, guided the discussions but allowed the ordinary reader to contribute to literary criticism. By publishing contradictory views about the novel, Donneau de Visé gave the impression that there was a vibrant debate surrounding the novel. By choosing La Princesse de Clèves, Donneau de Visé made that book the center of a controversy surrounding the novel as a new literary form.